Bile is a digestive agent that contains cholesterol, bile salts, and lecithin, amongst other things. Bile is passed to your gallbladder, where it is temporarily stored until food arrives in your small intestine. When this happens, the bile is released and passes through the cystic and bile ducts into the small intestine. Eventually, the toxins are passed out of your body as waste. Normally, your gallbladder, like most of your organs, works like clockwork, doing its job without you ever being aware of what’s going on. But sometimes one of the compounds in bile — usually cholesterol — becomes so saturated that it forms a solid. This is called a gallstone. It is estimated that as many as one in 10 people have gallstones, though they might not know it. In one clinical study, researchers wanted to study the link between gallstone formation and diet. They already knew that gallstone disease was a common condition in Western populations, so they decided to see the effect alcohol, tobacco, caffeine consumption, and a vegetarian diet had on gallstone prevalence. A total of 2,417 individuals underwent an ultrasound examination and completed a standardized questionnaire as part of the study. While the researchers found that tobacco, caffeine, and a vegetarian diet had minimal effects on the prevalence of gallstones, a protective effect was actually found for alcohol consumption. 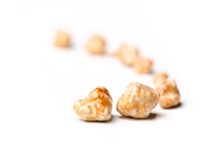 The best way to deal with gallstones is not to get them in the first place. Treating them after they form can be a bit more of a challenge. Diet, as with many health conditions, is probably your best line of defense against gallstones and gallbladder attacks. Go ahead and have that glass of red wine with dinner. It can help to break down the fats that lead to gallstone formation. Do just keep it to one glass, though. Research also shows that diets high in fiber and low in fat could help prevent the formation of gallstones. Vitamins C and E are important, too. A deficiency in vitamin C can lead to gallstones, and vitamin E helps to break down fats.